In the morning of October 16, 2018, Vice President Soichiro Matsudaira, etc. 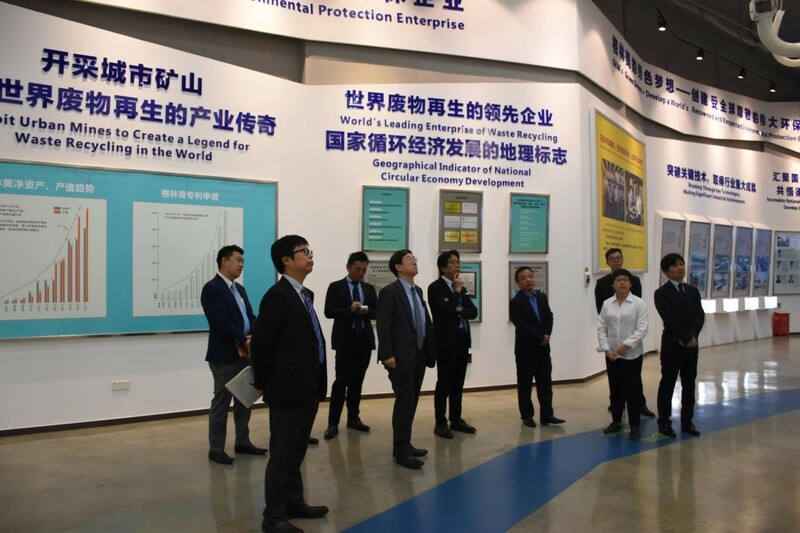 from Toyota Tsusho Corporation visited GEM Jingmen and Wuhan Circulation Industrial Park on a business tour. Deputy General Manager Zhou Jifeng of GEM warmly received them, and accompanied them on a visit to the Urban Mine Museum, National Research Center of Electronic Waste Recycle Engineering Technology, intelligent information monitoring platform, Power Battery Material Industrial Park, Test Center for Comprehensive Utilization of Waste Power Battery, ternary raw material supply system, “Three Wastes” Management & Control Center, NCA and NCM Ternary Precursor Material Manufacturing Center, and Large Granular Cobalt Oxide Manufacturing Center. Vice President Soichiro Matsudaira, etc. fully understood GEM’s total life cycle value chain of “battery recycling—raw material regeneration—material regeneration—battery pack regeneration”, and expressed heartfelt praise on GEM’s perfect waste treatment and environment management & control system. In the afternoon, Soichiro Matsudaira, etc. visited the waste power battery pack disassembly base, GEM Engineering Research Center for Cyclic Utilization of Automotive Power Battery, scrap car green disassembly workshop, plastic product cyclic utilization workshop, and electronic waste disassembly workshop at the GEM (Wuhan) Circulation Industrial Park, to experience GEM’s whole process up close from the standardized recovery and warehousing of waste power battery to standardized disassembly and testing to the production of cascade utilization products. At the symposium, Vice President Soichiro Matsudaira expressed deep admiration for GEM’s achievements in environmental protection, and looked forward to carrying out in-depth cooperation with GEM on recycling of waste power battery and protection of human environment. Deputy General Manager Zhou Jifeng said: GEM is more than willing to carry on comprehensive cooperation with Toyota Tsusho on the construction of total life cycle value chain of waste power battery recovery and recycling, and looking forward to making a contribution to the cyclic utilization of resources through bilateral cooperation. In the end, Vice President Soichiro Matsudaira and Deputy General Manager Zhou Jifeng reached a consensus: both parties should establish a joint working group as soon as possible, combine their respective industry characteristics and advents, and carry out the preliminary work of in-depth cooperation on automotive industry from design to recycling and new energy industry from material production to battery pack recovery and regeneration. Mr. Toshiyuki Toda, Special Advisor of Board Chairman, accompanied on the tour.